The sapling has a direct link to pine cones collected on the Lone Pine battlefield in 1915, a site where 2000 Australian and 7000 Turkish soldiers lost their lives. The Australian War Memorial, in conjunction with Canberra’s Yarralumla Nursery, now produce Lone Pine seedlings that can trace their ancestry to these pine cones. 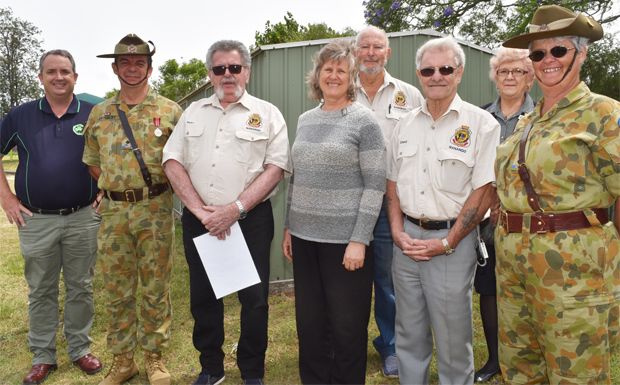 The Nanango RSL Sub-Branch recently purchased nine 200mm seedlings from the War Memorial which were entrusted to the care of Anne Maree Lee, from Nanango, to nuture. Seven developed into saplings and the Sub-Branch now plans to plant these at various locations throughout the community, including at the Nanango RSL Club and Nanango State High School. 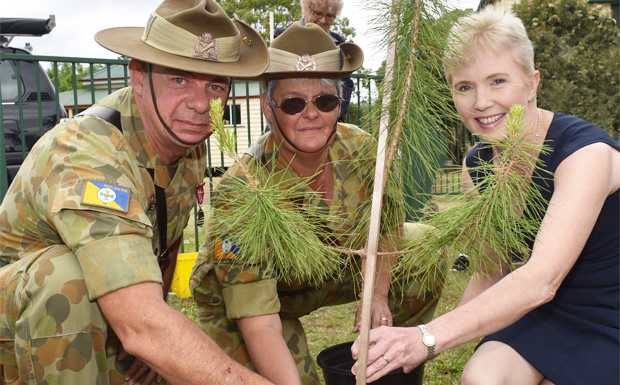 The first of the young trees was placed into its new home at St Patrick’s Catholic School by Cr Roz Frohloff and officers from 177 Australian Cadet Unit, based in Nanango, watched by students and guests. Lowrian Redsell, from the Nanango Sub-Branch Citizens Auxiliary, explained the significance of the Lone Pine before the sapling was lowered into the ground. Nanango RSL Sub-Branch president Bert Stevens then read the Ode. St Patrick’s principal Matthew Vine thanked the Sub-Branch for giving the school the honour of caring for the tree. “We want this tree to grow tall and be a survivor,” he said.